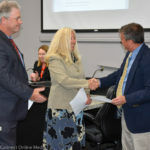 Incoming Safety Harbor City Commissioners (l-r) Andy Zodrow, Nancy Besore and Cliff Merz were sworn into office on Monday, Mar. 19 following their 2018 municipal election wins the previous week. The swearing-in ceremonies that follow Election Day are typically emotional affairs, with the joy and excitement of the incoming legislators and the wistful sorrow of departing officials on full display. 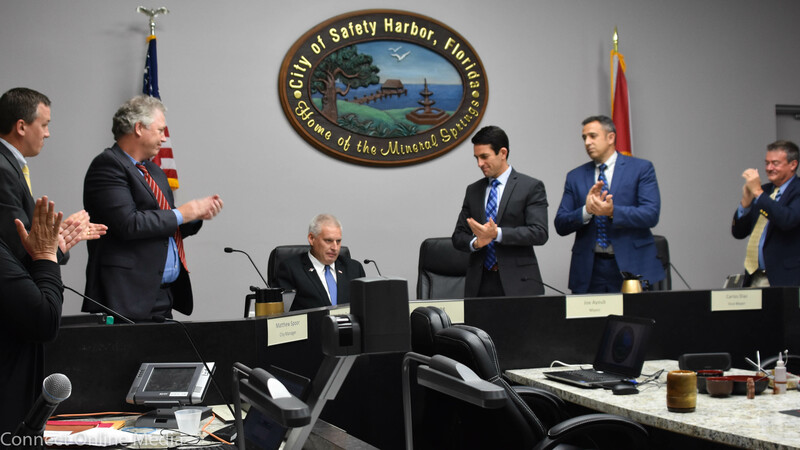 Monday night in Safety Harbor was no exception, as six days after the 2018 municipal election the three City Commission-race winners—Nancy Besore, Cliff Merz and Andy Zodrow—were sworn into office shortly after Seat 1 incumbent Scott Long exited the dais to be replaced by Besore. The ceremonies were filled with laughter and tears, none more so than Long’s sendoff, which included comments from his fellow local lawmakers and city officials plus the presentation of a street sign and a key to the city. 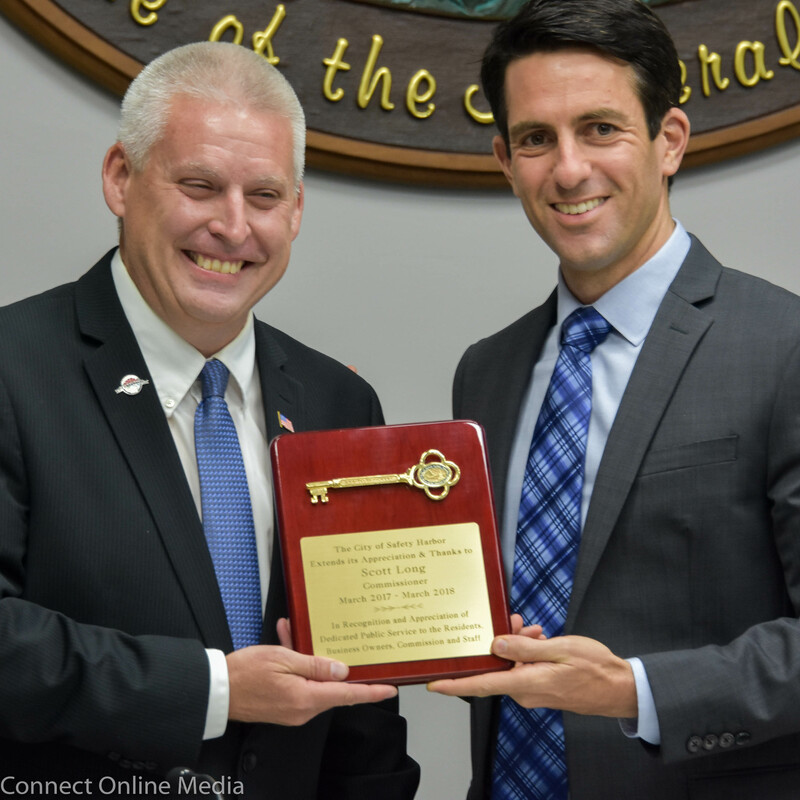 Safety Harbor Mayor Joe Ayoub (r) presented outgoing City Commissioner Scott Long with a key to the city on Monday, Mar. 19, 2018. “This has been one heck of a year, I gotta say. It seems like yesterday that you were just sworn in,” Mayor Joe Ayoub told Long, who was elected to finish the final year of Janet Hooper’s term when he narrowly defeated Besore in the 2017 election. Ayoub then went on to list several accomplishments that took place during Long’s tenure, which included everything from the serious (improving race relations and promoting affordable housing) to the sublime (his love of colorful costumes and having fun, often in the service of helping others). “You brought an abundance of positive energy to this city and an intense focus on citizens’ concerns, all in just one year,” the mayor concluded. 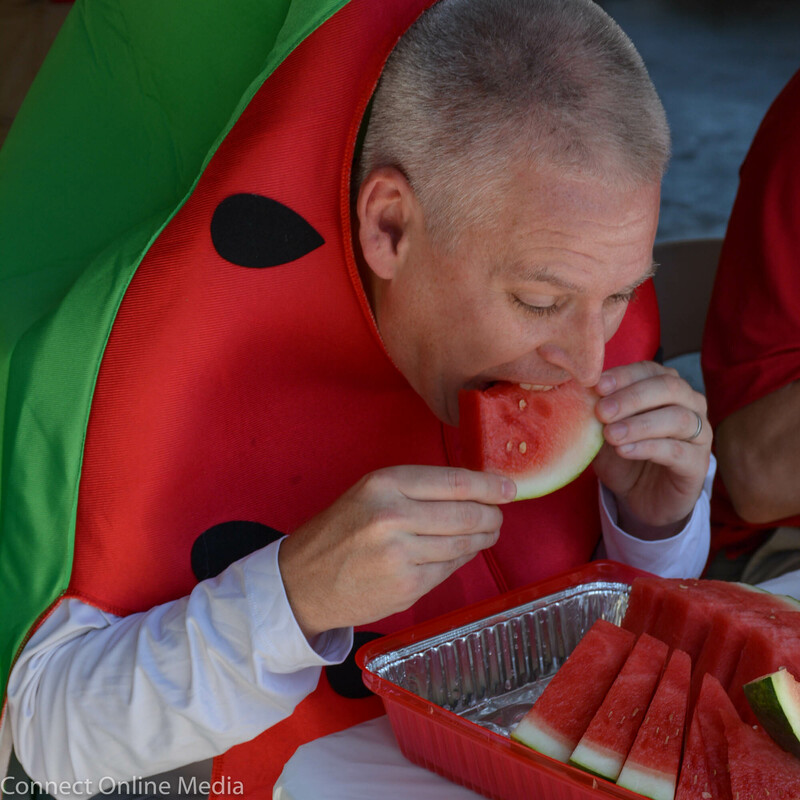 Safety Harbor City Commissioner Scott Long founded, and competed in, the inaugural Melons for Moolah charity eating event on Sunday, July 7, 2017. “I’m very proud of everything I accomplished, and I want to thank everyone for recognizing that,” he said. After urging the commission to remain focused on providing more affordable housing in town, Long, a former journalist and co-founder of an online poker magazine, used his trademark candor to explain why he believed he was exiting office. “I’m very aware that my position on economic development is what got me elected last year, and I’m very aware that my position on economic development is what got me fired last week,” he said. “I’ve always been honest with people who have actually taken the time to get to know me and talk to me…about what I was trying to accomplish with economic development. Long then returned the compliments to everyone on the dais and noted he still plans to have the community break the Guinness World Record for watermelon eating this summer, and he concluded his speech with a quote often attributed to Dr. Seuss, fitting for someone who once wore a Cat in the Hat costume. 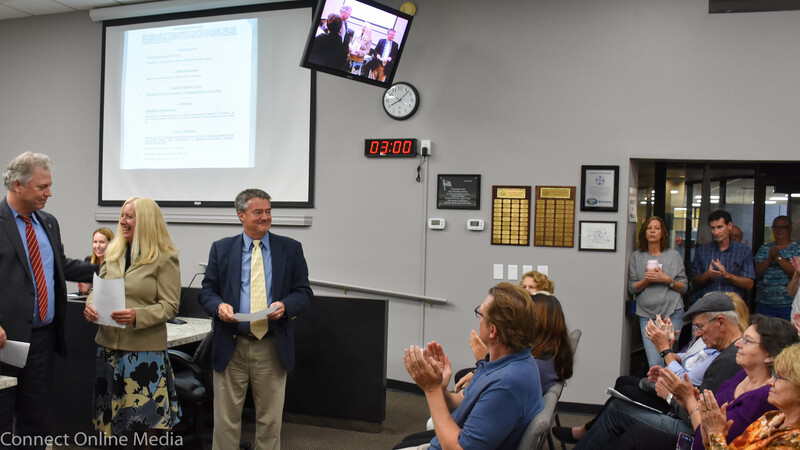 Safety Harbor officials applaud outgoing City Commissioner Scott Long on Monday, Mar. 19, 2018. 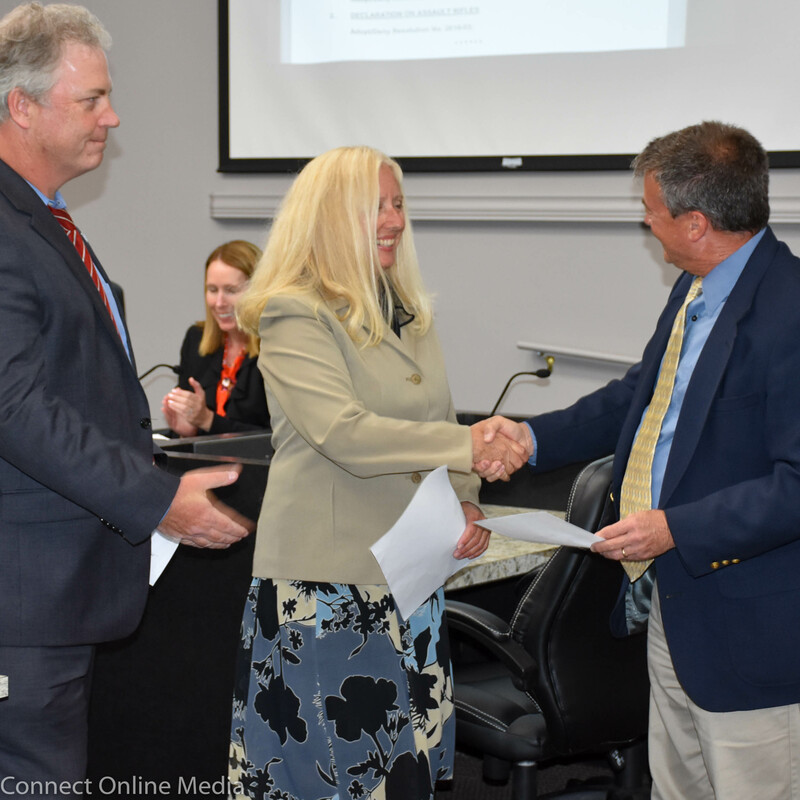 Following a brief recess, the incoming commissioners were sworn in; later in the meeting, the trio spoke about the election. “I’d like to express my extreme humbleness and thankfulness for those that provided me the opportunity to serve this city for a third term,” Merz, who handily defeated newcomer Spencer Bell last week, said during his Commission Report. 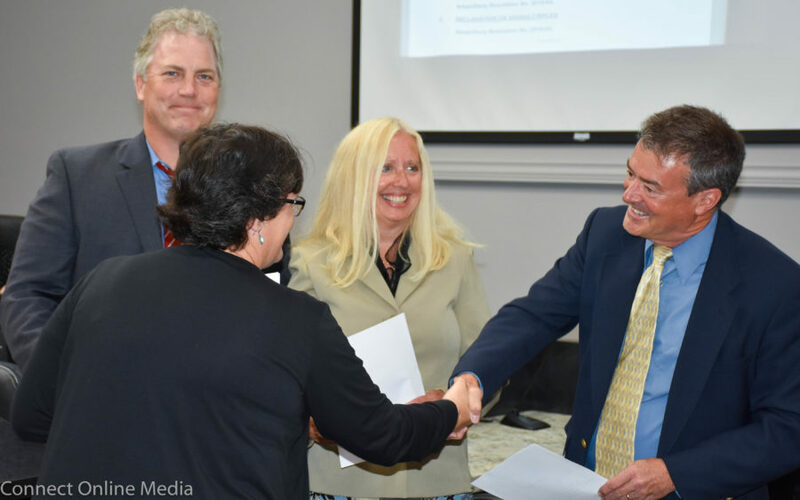 Newly elected Safety Harbor City Commissioners (l-r) Andy Zodrow, Nancy Besore and Cliff Merz congratulate each other following the trio’s swearing-in ceremony on Monday, Mar. 19, 2018. Zodrow, who was elected to his second full term last week, also expressed gratitude to his supporters before voicing what most everyone in the city felt last Wednesday. “I’m glad the election season is over and the campaign season is over,” Zodrow said following another contentious campaign season, littered with accusations and social media sniping, in Safety Harbor. Besore, the resilient former school teacher who has now won one and lost one election since “retiring” from public office following her failed mayoral run in 2014, thanked those who stayed with her throughout her journey back to office. “There are some of you who hung with me from the get-go, and I am just so appreciative,” she said. Newly elected Safety Harbor City Commissioners (l-r) Andy Zodrow, Nancy Besore and Cliff Merz receive an ovation from the SRO audience at City Hall following the trio’s swearing-in ceremony on Monday, Mar. 19, 2018. After the meeting, Besore spoke about returning to the commission after a four-year absence. “It felt good,” she told Safety Harbor Connect.